A leaf-feeding weevil, Tanymecus confusus, first was observed feeding on sugar beets in the southern portion of the Red River Valley (Richland County, N.D., and Wilkin County, Minn.) in 1975. The weevil has since caused problems for growers in southern Minnesota (Big Stone, Chippewa, Lac Qui Parle and Swift counties) in 1992 and 1997, and again in Richland County of North Dakota in 2004. A related species, Tanymecus palliatus , is an occasional pest of sugar beets in Europe. 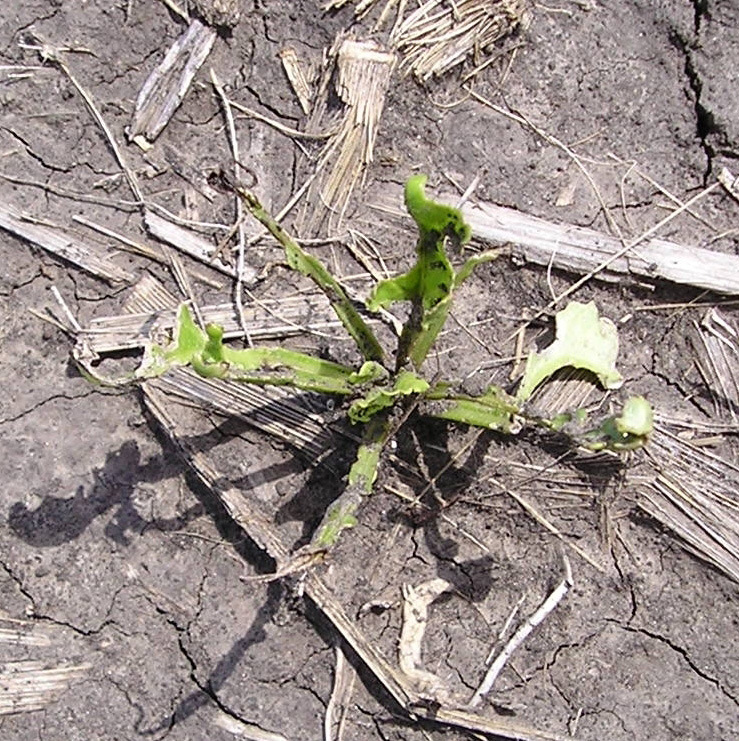 Feeding injury by adult Tanymecus confusus typically occurs in small areas within sugar beet fields. Damage is occasionally severe enough to require replanting. Adults of the leaf-feeding weevil are about 1/2 inch long, and their head narrows slightly toward its tip into a broad snout. This is a typical feature of the weevil group of insects (a.k.a. snout beetles). Leaf-feeding weevils are mottled brown to brownish gray (Figure 1), and their bodies are covered with minute, gray, hairlike structures. Because this weevil is a rare sugar beet pest and it has not been reported on other crops grown in the area, little is known about its biology or its control. Researchers believe the insect overwinters as an adult in the soil or in plant residues. Adult weevils emerge in the spring and mate, and females then deposit eggs in host plant tissues. Known host plants include pigweed, cocklebur, wild sunflower and ragweed species. Larvae (immature weevils) are believed to feed on these plants until they develop into adults. The adults then re-infest these hosts or, on occasion, infest neighboring sugar beet plants. No larvae have been observed feeding on sugar beets. Damaging infestations of leaf-feeding weevils in sugar beet fields usually have occurred during the first three weeks in May, although weevils also have been observed feeding on sugar beets as late as June. Adult weevils use chewing mouthparts to feed on cotyledons and leaves of young sugar beet plants (Figure 2). Field damage usually appears as circular or oval-shaped patches in affected areas (Figure 3). The weevils generally feed on leaf edges and interveinal areas but usually leave the midrib intact. Significant feeding damage can result in seedling death. Younger plants are especially vulnerable to attack. Weevils are difficult to find on or near damaged plants because they fall to the ground and “play dead” by remaining motionless after being disturbed. Also, their dark mottled coloring makes them difficult to detect on the ground. Careful inspection will reveal the insects in plant debris or in the soil immediately surrounding damaged plants. Control of early season broadleaf weeds should be an effective cultural strategy for minimizing the risk of weevil feeding injury to sugar beets. Field scouting for adult weevils and timely application of insecticides will be necessary to control damaging populations. Insecticides labeled for use on sugar beets that have activity as stomach poisons in other beetles, especially weevils, should control the leaf-feeding weevil. Partial printing costs of this publication were provided by the Sugarbeet Research and Education Board of Minnesota and North Dakota, which had no editorial input into the content. Armstrong, J.S., A. Cattanach and L. Buss. 1998. Defoliating weevil identified and damage described from the southern Minnesota Beet Sugar Coop area. In: 1997 Sugarbeet Res. Ext. Rep. 28: 256-257. This publication was authored by Mohamed Khan, NDSU Extension/University of Minnesota sugar beet specialist; Mark Boetel, NDSU research and Extension entomologist; and Lonny Buss, Southern Minnesota Beet Sugar Cooperative agriculturist, 2004.